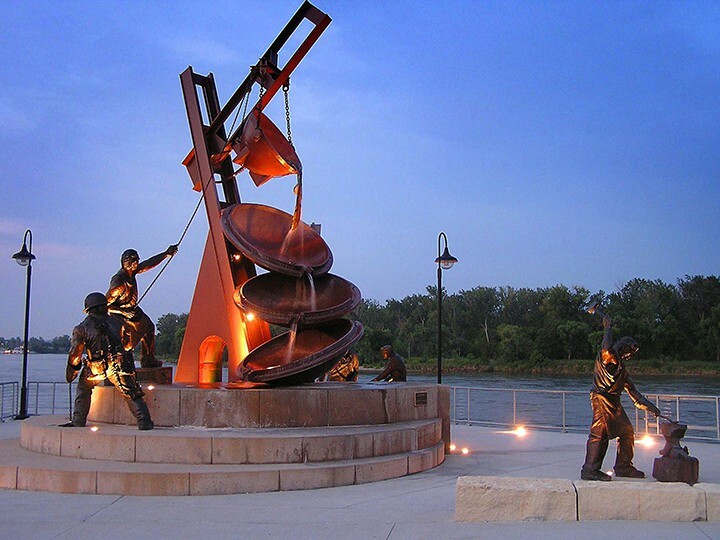 In many cases, monumental sculpture often becomes a landmark, and a historical marker. Learning the backstory to each piece before it is created is vital to the design process. Understanding the history behind the sculpture helps the artist better send a message through his design. Whether the emotion that the artist is trying to evoke is somber, joyful or anything in between, Matthew brings fourth the story in each monument that he creates. In some cases, the viewer may not know the background of the piece, so Matthew seeks out to tell a story in each piece. Understanding the need for the piece and the passion behind every story, is one of the most important puzzle pieces that needs to be in place before the beginning of each monument. Researching and learning the history before beginning the concept of each piece is one of Placzek’s favorite parts of the entire process. Monumental Sculpture is, in many cases, meant to be observed and held in reverence. Matthew has a different view on the matter, “You’ll notice quickly that the sculptures I create are designed with the viewer in mind,” Placzek says. “Essentially, I am giving them an open invitation to interact with and explore my work”. Matthew believes that letting the viewer interact with the sculptures brings them into the past, allowing them to understand the emotion, feelings and history behind the art.